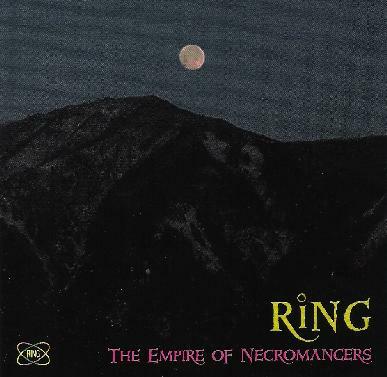 Ring - "The Empire of Necromancers"
Ring were a Japanese progressive rock band that recorded in the 1970's, though I'm unclear as to whether an album was ever released. The CD consists of 5 tracks recorded in 1975, plus 2 bonus tracks recorded some years later by keyboardist Takashi Kokubo, who interestingly was the drummer and singer at the time of the 1975 Ring lineup. Prog fans who like to leave no stone unturned as regards 70's bands will likely enjoy this album. The band were a guitar/bass/drums/keyboards/vocals quartet, and draw heavily on classical influences, while at the same time being a rock band in the way Focus was. The 11 minute opening track - "Prologue" - is very mellow and dreamy throughout much of the track, though Ring do rock out a bit in the last several minutes. There are some vocals though it's mostly instrumental and Ring do a respectable job with both keyboard and guitar melodies. I dig the bluesy jam at the end of the track and the accompanying synthesizer embellishments. "The White Sybil" is next and again starts off very dreamily, but soon launches into a fiery prog-jazz jam that demonstrates some decent instrumental chops. Alas, with the exception of a brief high energy segment on "Magic Lady", that's the only time Ring really cut loose. Which is too bad because there's clearly a hard rock band hiding somewhere inside these guys. The performance is mostly laid back, though still enjoyable and probably only of real interest to diehard fans of obscure 70's progressive bands. In a somewhat different realm is the keyboard dominated music on the Takashi Kokubo bonus tracks. "The Star of Sorrow" is a very dark and haunting atmospheric piece. And "In Memory Of Charnades The Pan" starts off as a smoking ELP influenced track that would actually fit nicely on an Ars Nova album. But about halfway through the 11+ minute track Kokubo goes into deep space for a bit, before transitioning to a very Pink Floyd-esque segment reminiscent of Wish You Were Here, before winding things down by returning to the ELP styled bit that opened the track. Highly derivative, but if these descriptions interest you then you're sure to dig it.